My involvement in this project is, above all else, the result of Alynn Guerras desire to incite critical discourse through the shared visual language, traditions, and tools of printmaking. Her belief in the continued viability of this ancient medium is evident all around us, filling the walls and floor space of Red Hydrant Press, and serves as an inspiration to each visitor. Celebrants believe that during The Day of the Dead the souls of the departed are permitted once again to visit the living, tempted to return by ofrendas (offerings) and festivities. In their homes, families construct elaborate altars of food, photos, marigolds and other mementos. At cemeteries, gravesites are decorated with candies, liquor, perhaps toys for dead children. Such offerings not only entice the dead to come home, but sustain them during their brief stays. Among the most popular and commonly reproduced symbolism of The Day of the Dead (certainly the imagery most referenced by artists participating in Dead End!) are the calaveras, skulls or entire skeletons that mime the activities of everyday life, riding bicycles, playing music, dancing, laughing, etc. These images are customarily accompanied by poems, mocking epitaphs of the living (from friends to political figures) that poke fun at unusual habits or share embarrassing anecdotes. Historically, The Day of the Dead and printmaking are seamlessly interwoven. Celebrations of the holiday have long been propagated through cheaply reproduced, widely disseminated street literature, or broadsides, themselves a popular Mexican (and print) tradition. Broadsides are essentially one-sided posters, at times composed solely of pictures, in order to appeal to both literate and illiterate alike. Many of the graphic motifs commonly associated with The Day of the Dead (especially beyond Mexico) can be traced back to the creators of these posters. The most widely recognized of these artists is Jose Guadalupe Posada, a prolific illustrator and printmaker who worked in Mexico City at the turn of the 20th Century. Posadas exquisite relief prints helped to popularize the holidays imagery and symbolism, most notably the calaveras. Posada conceived of his calaveras as social reportage and political satire. In this he has been succeeded by a multitude of Mexican and non-Mexican printmakers. The revolutionary, justice-seeking spirit of his work continues to flourish. From her former home, Mexico City, Alynn has brought to West Michigan her passion and capacity for printmaking, as well as a rich cultural background. In her youth and early adulthood she was exposed not only to the vital traditions of graphic art, but also proud displays of political activism, the proliferation of government propaganda, and emotionally charged, symbolically loaded festivals such as The Day of the Dead. Dead End is the logical outgrowth of such a fertile heritage, synthesizing many of Alynns experiences. 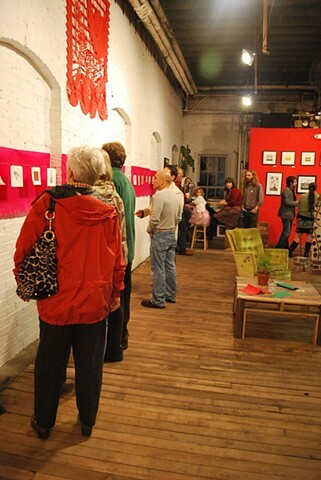 The initial Call for Entries and culminating exhibition have connected individuals from several states through their production of mini-prints around a central theme. This weekends reception - the prevailing event - serves to catalyze social and political discourse through art, and has successfully gathered together a community of family, friends, and strangers in remembrance of the departed. While encompassing several ancient traditions, Dead End retains and reflects the relevance of each, suggesting a model for our continued celebration of this life.